Okay, phlebologist now I said this in the intro of the show itself, visit web but just in case – you’re going to have to listen to part one, or this episode is going to make absolutely no sense. 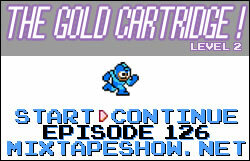 This is a continuation of Level 1 in the Gold Cartridge saga. As you’ll remember, our hero managed to scrape through Level 1 with two lives left – will he make it to the end of this world? How long is this game, anyway? What’s with the weird Department of Defense references? And is it just me or is the amount of video game themed tracks increasing exponentially recently? Some of these answers and more – all in today’s episode. introlude: an unnamed beat from Flying Lotus. I got this from him forever ago and have a feeling it’s since seen an official release, but don’t know what it’s called. Any ideas? Random – Intro (Epilogue). While this record is sort of hit-and-miss for me, anyone with the nerve to put together an entire concept album on Mega Man earns respect from me. m/random215. Random – Robot City feat YTCracker [short edit]. I actually got put up on YTC by someone who listened to the original Nintendo Mixtape forever ago, and I can’t lie, he’s not bad. There is an entire genre of this ‘nerdrap’ stuff, and most of it is unfortunately pretty terrible – but YTC is both an originator in the field and actually has flows. Dig the upper middle class whining about ‘posers’ – classic. Harmonic313 – From The D feat Guilty Simpson. Really, really old cut, but still goes hard. harmonic313.com. Clipse – Virginia (Team Teamwork Lost Woods Remix). This cut is seriously just too hard. Shouts to nxt for linking me on this. Concept, execution – brilliant. teamteamwork.bandcamp.com. Airborn Audio – Now I Lay Me Down. Probably better known as two thirds (H. Prizm and M Sayid) of Antipop Consortium. They only put out one record, and I think it really went over people’s heads, which is unfortunate because this really was sort of a dope album. Note the potential ambiguous Final Fantasy loop – which is probably actually just wishful thinking on my part. m/airbornaudio. Ghostface – Computer Love Remix. This cut is really old, you’ve probably all heard it, and there’s really not much to say here except that I know you’re glad I put it in anyway. Animal Style – Living Distance. Shouts to Aaron for the heads up on this one. m/animalstyle. …and that’s what it is this time around. holler at a scholar.